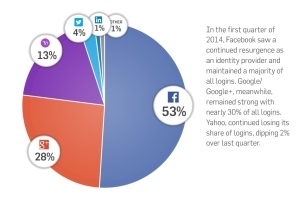 When it came to social logins in the first quarter of 2014, Facebook stood strong, regaining share in several industries and regions, while Google Plus held steady or registered gains, and Yahoo continued to plummet, according to the latest report from consumer-management-suite provider Gigya. In the fourth quarter of 2013, Gigya saw Facebook make strides in the war for identity, as it regained a sizable share of logins in a number of industry verticals and regions. In the first quarter of 2014, this trend continued, with the world’s largest social network seizing more than 51 percent of social logins in North America for the first time in three previous quarters. In the first quarter, we also saw Yahoo continue losing its share of logins in almost every single vertical and region — a trend that mirrors the company’s recent move to eliminate Facebook and Google/Google Plus logins from Yahoo properties. Google/Google Plus held onto a solid percentage of logins, as well, and made gains in mobile logins — a trend we expect to continue as Google works to seamlessly integrate Google/Google Plus identity into native Android devices. Readers: Did any of Gigya’s first-quarter-2014 findings surprise you?